Since the dawn of Firefox time, new tabs have opened at the far right of the tab bar. But with the introduction of Firefox 3.6, which was pushed out a few weeks ago, new tabs open to the immediate right of the current selected tab. I mean, I suppose there's a certain logic to the new method, but you're asking me to unlearn a habit (looking to the far right for new tabs) that's been ingrained for years. What's more, you forced this on me without asking, and without giving me an option to revert to the old way. If you want to turn back the clock on Firefox's new-tab behavior, you can--but it takes a little doing. 1. In the Firefox address bar, type about: config, then press Enter. 3. 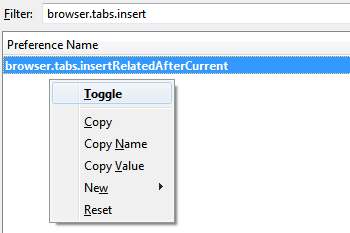 In the Filter field, type browser.tabs.insert. You should see the preference name browser.tabs.insertRelatedAfterCurrent appear. 4. Right-click that entry and then click Toggle. That'll change the Value setting to false. That's all there is to it! You don't even have to close that tab or restart Firefox. If you want to go back to the new way of opening new tabs, just repeat the steps and toggle the Value back to true. Okay, survey time: Which method do you prefer? I was actually just starting to get used to the new way, but now I'm thinking I may go back. Decisions, decisions.